WHITE Electronic Designs has announced the availability of its industrial grade CompactFlash cards in densities from 256MB to 4GB that operate from -40°C to +85°C. The new W7NCF series card family is specifically targeted for high-reliability applications and is compliant to CFA standard 2.1. 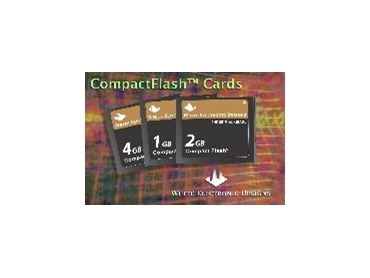 The CompactFlash cards are constructed with Samsung NAND SLC flash memory devices with a dedicated 32bit RISC controller. The card family supports 3.3V and 5.0V operation and meet MIL-STD-810 test methods for humidity, vibration and shock. The RoHS compliant cards are designed as 50 pin connector with Type I form factor.